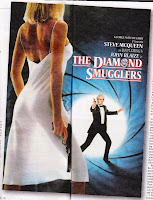 As mentioned, I recently had an article published in The Sunday Times about the long-running attempts to make a film of the Ian Fleming book The Diamond Smugglers. I've been researching this since 2007, and was delighted to discover a completed screenplay from 1964 by the best-selling Australian thriller-writer Jon Cleary, the existence of which has never before come to light. The article also explores the involvement of Robert Parrish (one of the directors of the Bond parody Casino Royale), Richard Todd, Kingsley Amis, Anthony Dawson, and several others, as well as revealing the tantalising prospect of Steve McQueen in the lead role, as a secret agent going undercover to infiltrate a diamond-smuggling ring in South Africa. It also raises some questions, including the whereabouts of Fleming's own outline for the film. You can read the whole article at The Sunday Times' website, but below are scans of the paper version. The final page, unfortunately, has lost a little text, as the margins simply couldn't fit into my scanner! So you may have to refer to the online version for that page. I've also made a sepatate scan of the artwork they used, a mock-up poster for the film featuring McQueen. Just click on the images to enlarge. 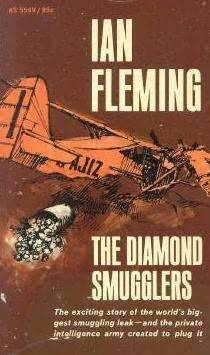 A new edition of The Diamond Smugglers was published by Ian Fleming Publications last year, and can be bought from them directly here.